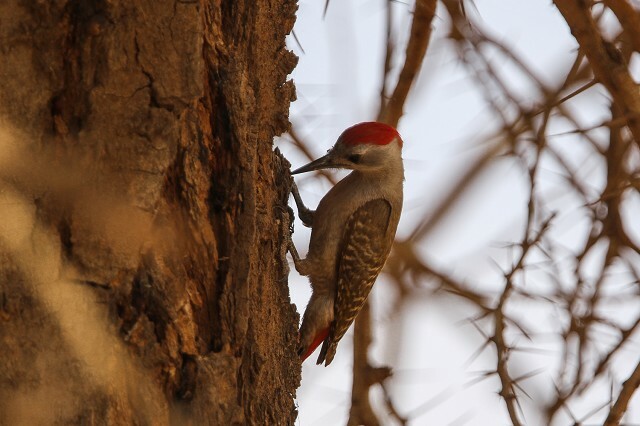 On 11 April 2016 Eric Didner was birding to the north-east of Ouadâne, Mauritania, when he came across an African Grey Woodpecker (Dendropicos goertae). The bird was frequenting large acacias close to Guelb er Richat and was well photographed. This is the first known record of the species within the Western Palearctic (WP), the southern boundary of which flows east to west through Mauritania at 21°N as defined by Birds of the Western Palearctic (Cramp & Simmons 1977). The discovery, while hugely significant in a WP context, is not as unexpected as it may seem: the town of Ouadâne, located on the south side of the Adrar Plateau, lies at 20°55'N – just 8 km south of the WP boundary. It is surprisingly green and something of an oasis situated in an otherwise barren landscape. 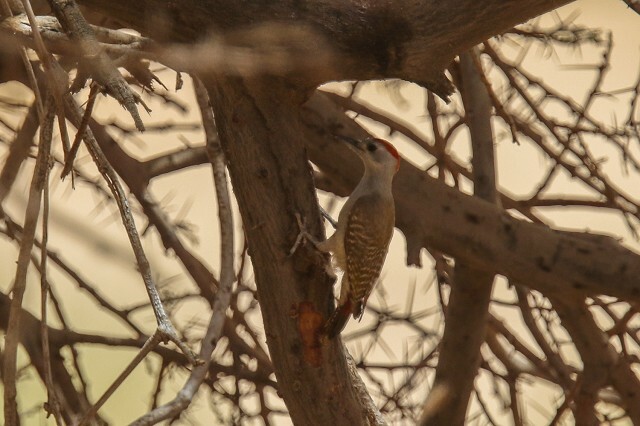 In April 2003 at least three pairs of Grey Woodpecker were recorded in Ouadâne with a further immature mist-netted (Salewski et al. 2005). 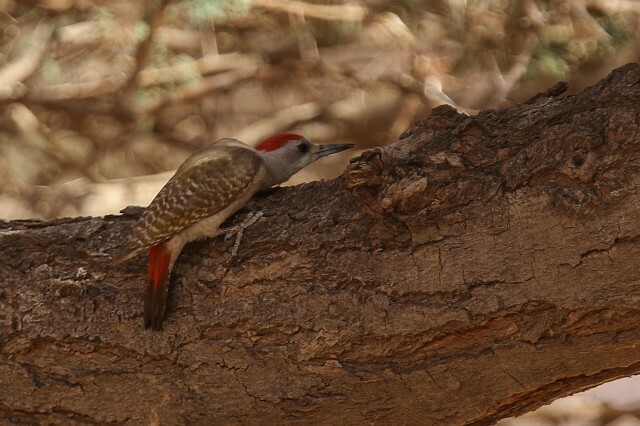 Before this, the species had been considered a 'rains or winter visitor, regular to 17°N, up to 20°N in Adrar region' (e.g. Lamarche 1988). The combination of breeding in 2003 and the presence of a bird in 2016 certainly seems to suggest that the species may be resident around Ouadâne, rather than an accidental. Eric also recorded a single Golden Nightjar (Caprimulgus eximius) in the immediate area, the bird accidentally disturbed during daytime and seen twice in flight. Again, this species was recorded at Ouadâne in early May 2003 (Salewski et al. 2005), suggesting that this year's observations are not a one-off occurrence. The amazing situation unfolding in Western Sahara regarding this species (see here and here) perhaps also lends credit to the notion that they are more regular this far north than previously thought, though this is nevertheless the first confirmed record of Golden Nightjar within the WP boundary in Mauritania. Three further Golden Nightjars were found singing at different locations around Atar, which is situated some 60 km south of the WP boundary at 20°31'N. Other observations of interest to WP birders included Sudan Golden Sparrows at several locations: for example 20 were at the woodpecker site north-east of Ouadâne and 10 were at El Beyedh (21.496, -11.342) though none were recorded around Choum, where this species has traditionally been found by visiting birders. A Black Bush Robin was at El Beyedh on 12 April. Away from the Adrar region, Mauritania's second Franklin's Gull was at Banc d'Arguin on 17 April where several each of Long-tailed Cormorant and Grey-headed Gull were also noted. Cramp S & Simmons K E L (editors). 1977. The Birds of the Western Palearctic 1. Oxford. Lamarche B. 1988. Liste commentée des oiseaux de Mauritanie. Etud. Sahariennes Ouest-Afr. 1: 1–162. Salewski V, Schmaljohann H & Herremans M. 2005. 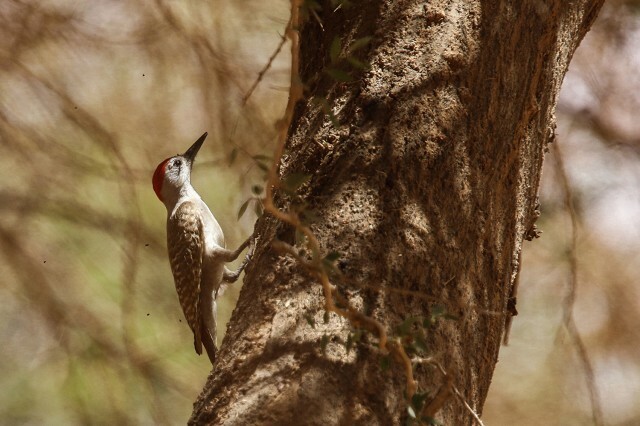 New bird records from Mauritania. Malimbus 27: pp 19-32.